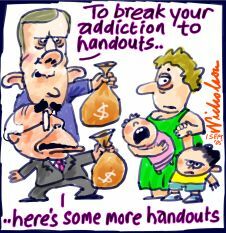 In addition, the social programmes offered by politicians over the years have only served to create a dependency syndrome and entitlement mentality. Moreover the "special treatment" of residents in "crime prone" areas have fostered a deeply engendered victim mentality. Sadly, this thinking system leads residents to regard themselves as a victim of the negative actions of others and to constantly think, speak and act in that manner. Regrettably this neuters the underclass to even attempt at making strides towards seeking an alternate lifestyle that offers more fulfillment. After all, why even try, I am a victim and will be oppressed anyway. The notion that they are not in control of their own destiny is consequently internalized. Unfortunately these mental hegemons are monumental, it consequently follows that a victim needs help, for they cannot help themselves; a severe dependency is therefore developed. Ironically this phenomenon validates the wardship of the political class. Even more destructive than the consequences described above, is how this contributes toward crime and violence upon the greater citizenry. The "under-privileged" wards of the state are conditioned not to earn a living, but rather to receive or take the resources generated by tax payers. This presupposes entitlement to other peoples resources. Why wait for a government hand out when you can "tax" the population directly and eliminate the inefficient middleman? Robbery and theft from private citizens has inadvertently been justified. 1. Phase out social welfare programmes which would eliminate the dependency syndrome and at the same time communicate confidence in traditionally under-performing communities that they can not just survive but thrive on their own. 2. Eliminate taxes on persons and businesses who live, work or have businesses in under-performing communities; this will incentivize productivity and effort. 3. Treat crime prone areas exactly the way non crime prone areas are treated -make best efforts to enforce laws especially as it relates to violations of persons and property. Everyone including the supposed underclass should be left to express their fullest potential unencumbered by arrogant bureaucrat policies. You can easily comment anonymously if you'd like.